I'm once again taking part in One Monthly Goal, hosted by Patty at Elm Street Quilts. I really appreciate this motivation to set a goal the first of the month, and work on that goal. Thanks again so much Patty for this motivation. This month I hope to finish one of my crazy quilt UFOs. I plan to finish embellishing this block with stitches, beads, etc, and send it off to its owner. Recently Shelly at Prairie Moon Quilts had an end of 2018 3-day task challenge. The last day was to perform a project assessment, and see where you are, whether you want to continue, or donate. I spent 2 days going through my sewing room. I still have to make up my formal organized list, but I went through my entire room. I have 19 unfinished crazy quilt projects alone. I participated in a ton of crazy quilt round robin swaps, and these need to be finished along with my numerous other projects. I will have totals of the other projects once I make up my organized list. I have had company for 3 days, and they left this morning. So I will be busy taking down Christmas decorations, and then maybe tomorrow I can get back to my regular activities. 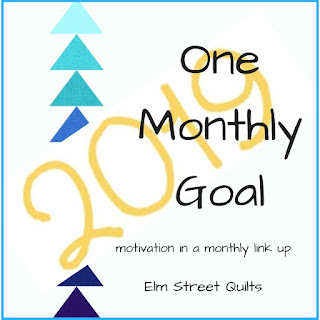 I will be linking up my One Monthly Goal with Patty at Elm Street Quilts. It isn't too late for you to do so too! That is SO pretty, Karrin. I know it will be well received. I look forward to seeing your list. I'm beginning to think I'm not the one with the most UFOs. LOL I hope your visit was wonderful, but I know I would be ready to get back to a normal routine, so I don't blame you for looking forward to that. Best of luck finishing this. I know you will probably finish at least 3 things this month! So pretty. Thanks for linking up with Elm Street Quilts One Monthly Goal and good luck with your project.